American Thanksgiving is just around the corner... on Thursday, November 23, to be exact. This is such a fun holiday as it is a time when family and friends get together to celebrate by giving thanks. 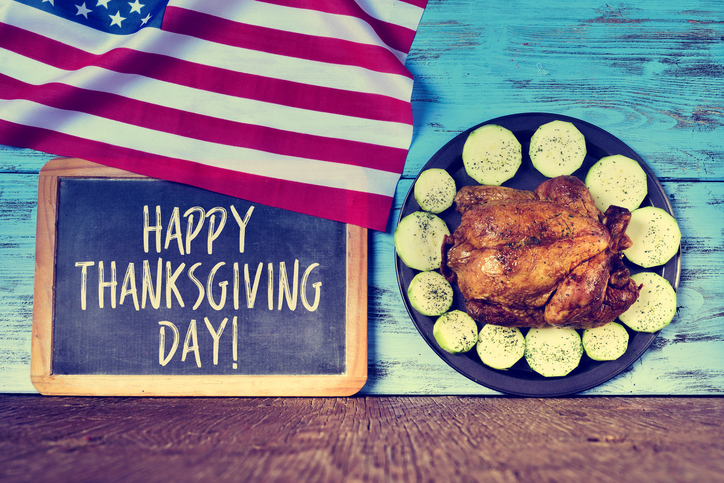 Thanksgiving became a national holiday in 1863 when Abraham Lincoln made the proclamation (during the civil war) to "set apart and observe the last Thursday of November next as a day of Thanksgiving and praise". In 1941, Congress declared Thanksgiving Day as a Federal Holiday. Why do we eat turkey? Many years ago, unlike today, turkey was hard to come by and hence a real delicacy. Even though you can find frozen and fresh turkeys in most supermarkets, delis and meat markets today, turkey remains the traditional holiday treat. And of course, you can't forget all the other yummy foods that accompany this festive meal: cranberry sauce, sweet potatoes and yams, stuffing, gravy, mashed potatoes, brussel sprouts and last but definitely not least, pumpkin pie! 1. Hawaii - November is a great time of year to visit Hawaii because there are much less tourists. Because of this hotels will be somewhat more affordable and you won't have to battle large crowds. Most hotels and resorts offer turkey dinners with all the trimmings. Rent a cheap car and drive through Waikiki where you can view the annual Thanksgiving Parade. And of course, you'll be able to get some quality beach time in with family and friends. Enjoy swimming, snorkeling, diving and much, much more. 2. Orlando - Most Disney World Resorts offer Thanksgiving feasts so you and your family will not miss out on the celebrations. Park your cheap Orlando Car Rental at the hotel and spend the day in the theme park and Universal Studios. Disney Cruise Line has a special Thanksgiving cruise that includes all the Disney characters dressed in Thanksgiving attire, a holiday meal and special Thanksgiving decorations. 3. New York City - Without a doubt, one of the most exciting places to visit for Thanksgiving is New York City. The Big Apple is famous for its Thanksgiving Day Parade. Thousands of people participate, all decked out in holiday costumes and paraphernalia. Over 50 million viewers watch this parade on TV from home! It is definitely not something to be missed whether you can physically be there or if you are sitting at home on the couch. If you are going to go, make sure to plan ahead so you have a place to park your cheap car rental. You don't want to miss out on this fantastic event! 4. Chicago - The 'Windy City' has many free Thanksgiving Holiday attractions and activities. So save additional cash by using car rental coupons and to see the three hour annual Thanksgiving Day Parade - one of the larges parades in the country! You should also make sure to visit Millennium Park where you and your family can go ice skating for free!